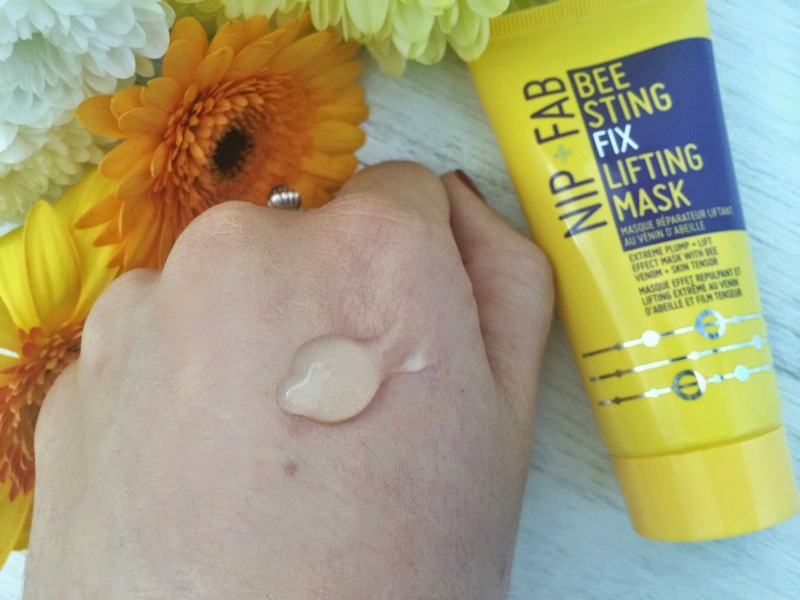 Nip + Fab are a brand I have been aware of for ages now, although I have only tried their body butters (which are amazing and surprisingly light) I have always been curious about their skincare and just recently I have been seeing more and more of their products popping up in shops. I even spotted on their Instagram that the gorgeous Millie Mackintosh from Made in Chelsea is the new face of the brand which is pretty awesome. For the past couple of weeks I have been trialling their latest offering of the Bee Sting line which contains actual bee venom...woah right?!.. I was kind of anxious about giving these a go because of that ingredient, but on the other hand I was pretty excited as I've never tried anything like it before. 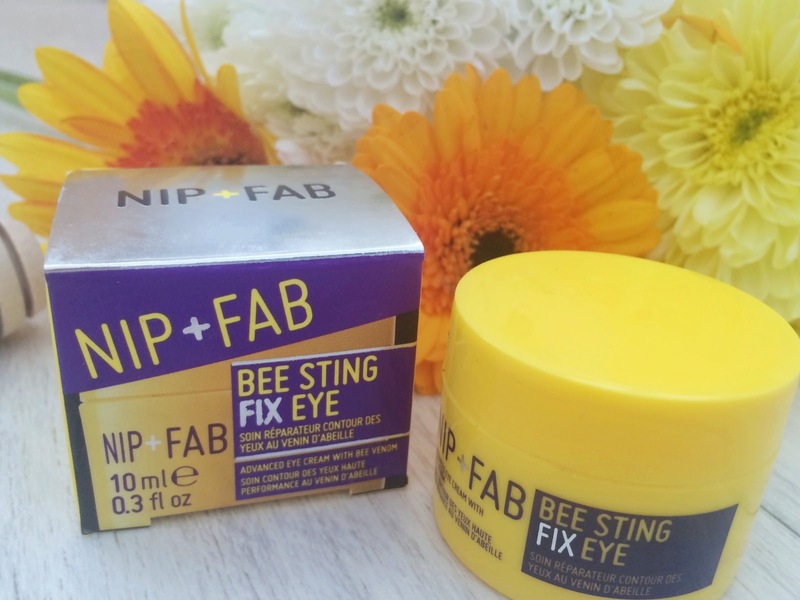 I have seen a few very pricey skincare brands around that have bee venom popped in some of their products as its supposed to have an amazing ,lifting and plumping effect on the skin, but now you don't have to spend top dollar thanks to Nip + Fab. Bee Venom is also known to be able to control the facial muscles, increases blood circulation gently plumping out and firming the skin. It also fills and smooth's fine lines and wrinkles. Who would have known some bee venom could do all of that eh?. 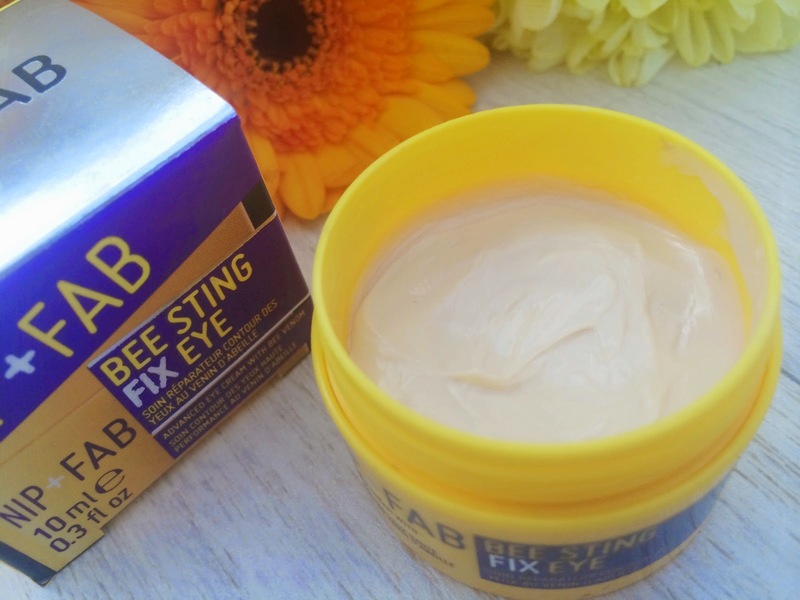 The range I have here consists of the Bee Sting Deluxe Body Soufflé, Bee Sting Fix Lifting Mask, Bee Sting Fix Eye, Bee Sting Fix Cream Deluxe. 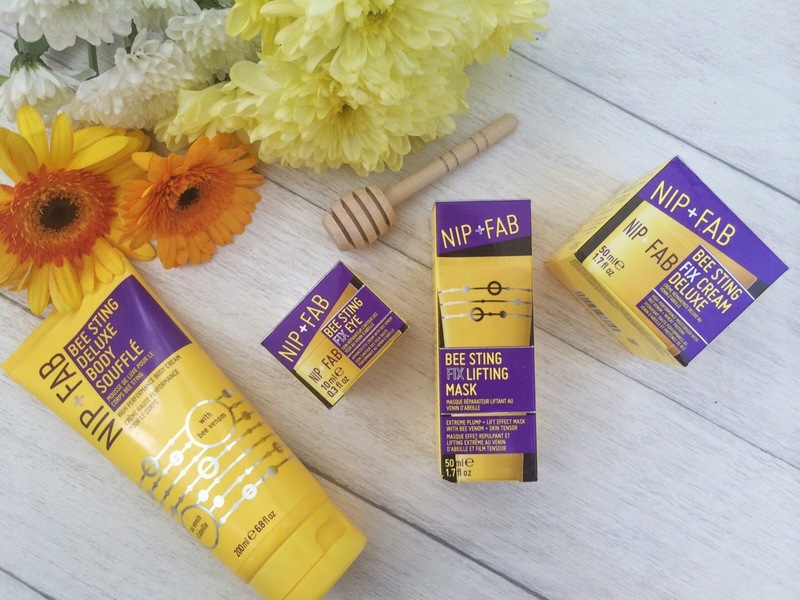 I really love all the Nip + Fab packaging, this particular range have yellow tubes/pots with purple and silver accents which really pop and make it stand out from anything else on the shelves, without it looking tacky. This Body Soufflé is super-rich and intensively moisturising, its supposed to help plump and firm while leaving your skin looking healthy with improved elasticity. 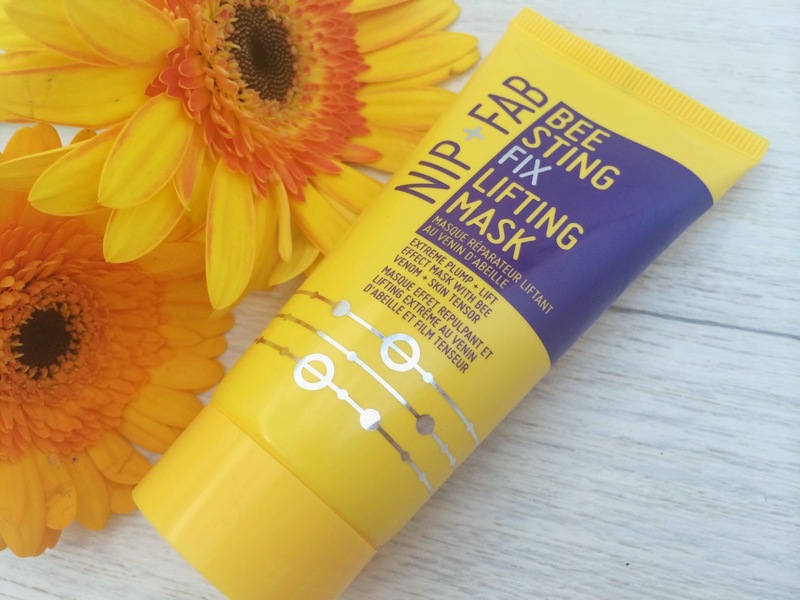 It has some amazing key ingredients to it such as the Bee Venom, Propolis Extract which has an activity against viruses and bacteria, Bees Wax to help soften and smooth, Shea butter and Honey to help soften, smooth and moisturise your skin. I have been using this most mornings all over my bod after the shower, and its actually a really lovely moisturiser and I've been really enjoying using it; It has a beautiful scent that's really fresh with a hint of honey to it and it really lingers on the skin too. 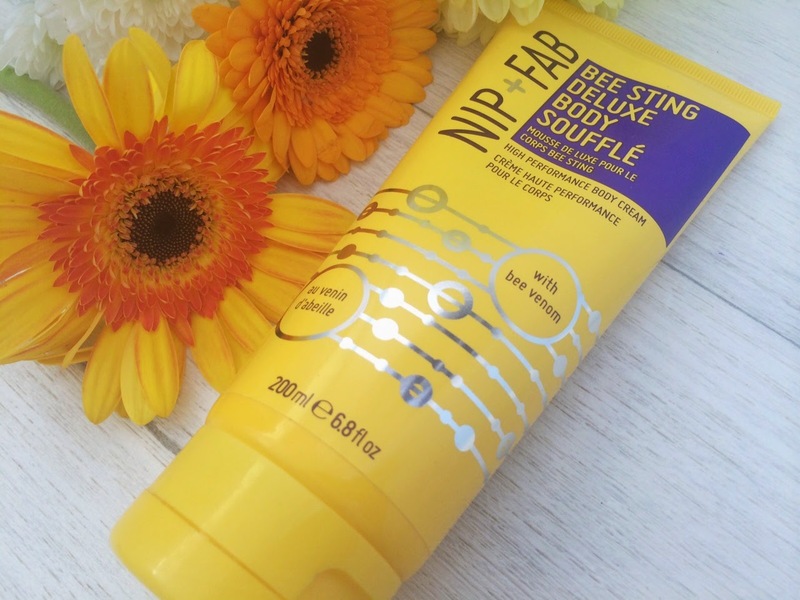 When you squeeze it out of the tube its rather thick, but when you start to rub it into the skin it absorbs so easily and feels very light yet moisturising at the same time, I also found it gives a very-ever-so-slight refreshing tingle, its perfect for those hot humid days. I cant really comment on the elasticity aspect of it because my skin is ok in that department (for now) but I did find it really helped with any dry patches I had like my elbows and knees. This face mask is an unusual one for me as its a gel-like formula and not something I've come across before, its supposed to help with fine lines and wrinkles while plumping and lifting with its special 3D express lifting technology, Skin is supposed to feel firmer for a more lifted facial contour. 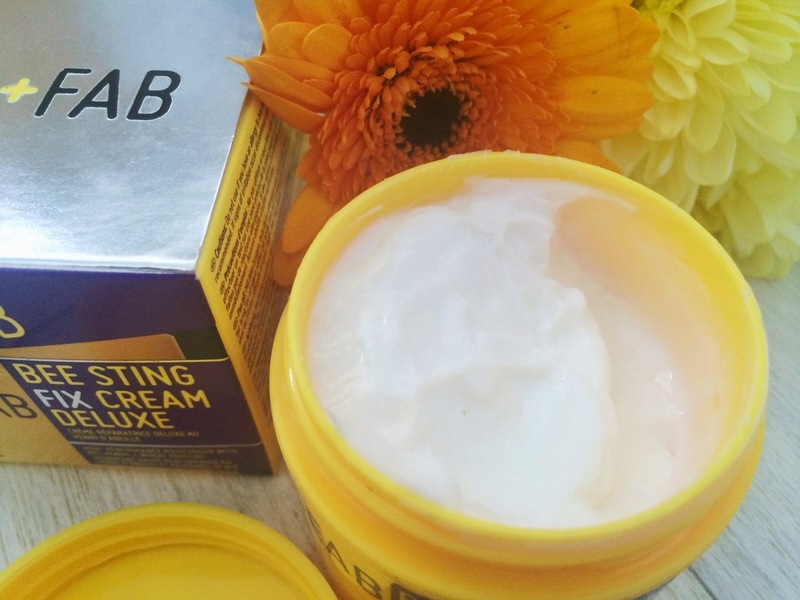 You wont believe some of the key ingredients of this mask! it contains the Bee Venom and Propolis Extract like the body soufflé but also includes Gransil which are little spheres that scatter incoming rays of light to diminish the reflected light, resulting in a matte look along with AC Moisture Plex to help retain moisture (similar to hyaluronic acid?) and Instensyl for immediate 3D lifting. Surely this sounds like one magical mask! All I do is apply a thick layer to freshly cleansed skin leave for 10 minutes and wash off with warm water. While its on it feels refreshing and gives off a bit of a tingle which to me shows its working, this can also be used as an overnight treatment and reminds me a little of the Origins Drink Up Intensive but more gel-like.. It also has the same lovely fresh honey scent. Once washed off my skin definitely feels and looks more plump/hydrated, I'm really impressed with this mask and can see myself repurchasing when I run out. This is said to be a moisturiser that provides a "second-skin" anti-ageing shield, helping to reduce the look of fine lines and wrinkles through skin hydration. It contains Bee Venom, Propolis Extract like the others mentioned.. and the oh-so-popular ingredient of the moment Hyaluronic Acid to lock in the skins moisture, Shea Butter to strengthen and repair as-well-as Vitamin E which is a powerful antioxidant. It says to use this day and nightly but I cant really get on with this in the day, it seems to leave my skin slightly tacky-to-the touch and my makeup didn't sit so well.. its also very thick - I prefer a lighter one for the day. Instead I have been using this as a night moisturiser and it works fine that way. You get a massive pot and you only need the teeniest amount for your whole face so its going to last you absolutely ages. Again I can't comment on it helping me with wrinkles as I'm only 25 but its most certainly hydrating! this is probably my least favourite thing from the range due to it feeling a tad sticky. I think this would be best for mature skins so I may see how my mum gets on with this (no offence mum sorry!). This is described as a stimulating eye cream that defends against the look of fatigue, it contains the same ingredients as the others like the Bee Venom (of course), Propolis Extract along with Cocoa Butter, Shea Butter, Tegocosmo to brighten and Elestan to firm. I use this at night too, purely because its so thick and I prefer something a bit lighter for day time. I am actually pretty impressed with this because I do have these little fine lines under my eyes that I can notice when I pop my foundation on, and this seems to have filled them out quite a bit, they are no where near as obvious now! its also very soothing and moisturising. Again this tub is going to last ages as you only need small amounts, these are such good value for money and just look at all the amazing ingredients/ properties inside. The whole range has the same fresh, honey scent to it, which I really like - but I know some people may not like fragrance in their facial skincare so this may not be for you. 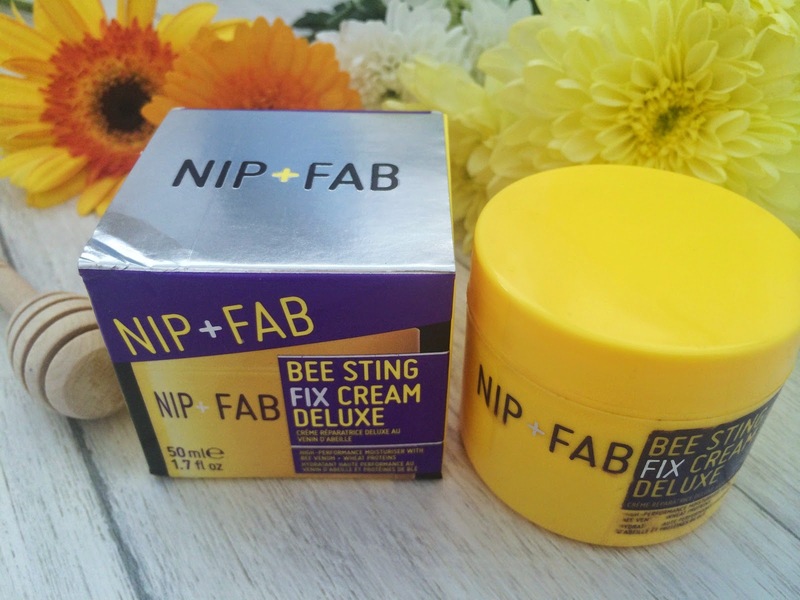 The stand out products from Nip + Fab Bee Sting range has to be the Body Soufflé, Face Mask and eye cream..sorry Mr Moisturiser, I may prefer you in the winter months when I need you more?. Overall I think these are brilliant products for the price as they use top quality ingredient's and such generous amounts of product too. You can buy all the products mentioned separate, or as a bundle from nipandfab.com for only £34.95 which is saving you over £25 (so if you fancy the lot may as well do it this way). I have also seen this range in my local Boots store. Have you tried anything from this range? 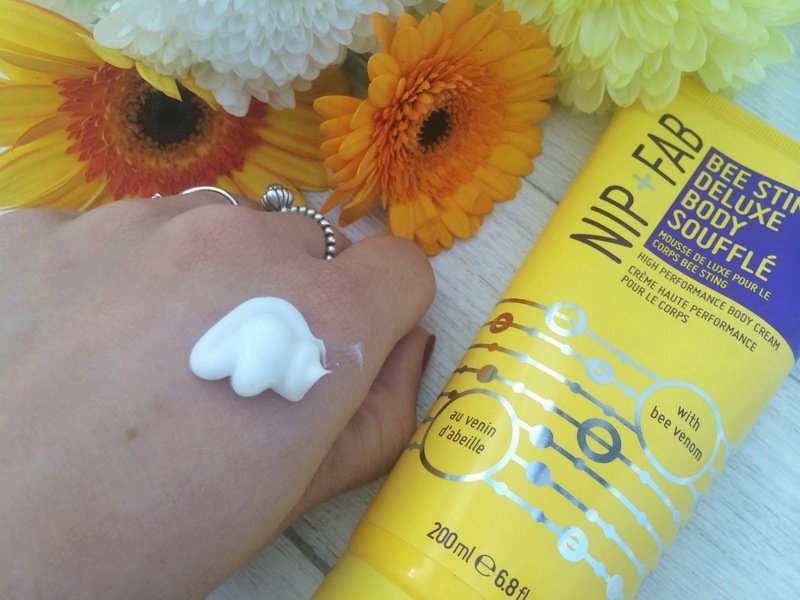 Have you used any products from Nip + Fab before? look forward to hearing your thoughts as always. I love all your review posts they are always so in dept and informative. I've been wanting to try Nip & fab for so long now I really should just go buy some. These sound lovely, although aimed maybe at 30s + ? I need to pick up that mask. I love Nip + Fab items so I have high hopes! Bee venom?! Now I'm curious... are these products cruelty-free? I am always up for a good new mask. I have only tried gel mask that is peel off and I enjoyed it very much. Bee venom! Wow. It's certainly got me interested haha :) Everything looks lovely to be honest! I'd like to try the face mask since it seems a little different! I also need a good moisturizer so I might give their range a go. Great post Zoe! These products sound amazing :) I love your blog and I have followed you with Bloglovin and GFC. If you ever get a chance to check out my blog I would be delighted thanks.